When you are facing with the granite countertops color selection, the most important thing is putting your personality in front. You might like the solid granite countertops color or patterned. The pool of color is very huge and the target is showing your kitchen as possible as the good looking. It is like picking the right person to make a commitment in your life. 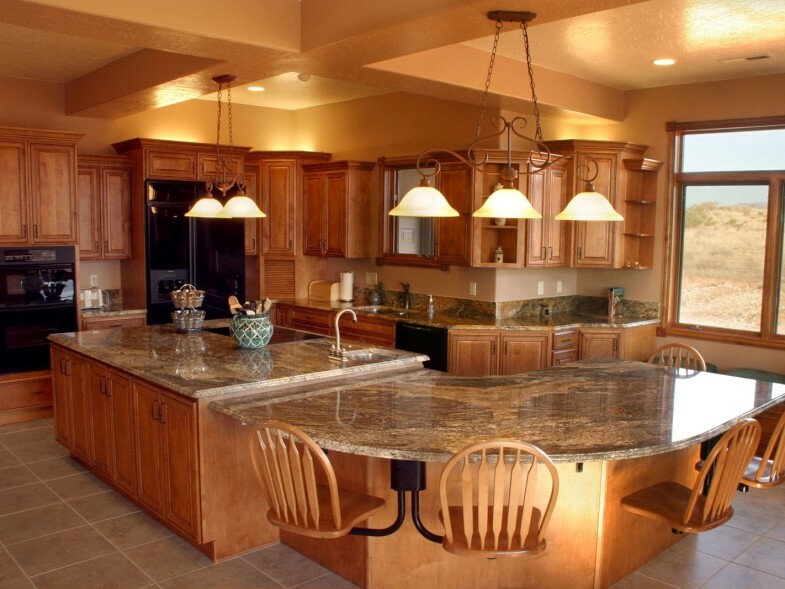 Without physically seeing the beauty of granite countertops color for your demands, you cannot make the last decision. There are some parameters to be known well about the granite itself and about the lighting and the labor that make countertop attractive. Camera and/or Ipod with you. Do not forget to get the sample of the slabs as much as you can and do not forget to write down the name of the granite, the company name and the price to the back face of the sample by using a marker. Remember you will be very exhausted to find the real treasure in the scavenger hunt. The one you like in the store, may not fit to your kitchen! The most important parameters are density and pattern. Density: Darker granites are denser than lighter granite. Lighter granites are less resistant to spots and stain. If pomegranate juice spills on it, no matter how fast you are in action to clean up, you will be unhappy with your choice. Pattern: As a truth, all granites has a pattern. If it is called solid, it means there is some homogenous distribution in the pattern. Picture Credit:Pacific Management LLC. Charming kitchen with detail oriented combinations. Else, it is called patterned. So, this part is very important for the pattern lovers, to select the right one. Pattern comes with the waves or veins, stone pieces and different colors batches in the slab. It is a heterogeneous mixture with a good blend of the chemical elements. Picture Credit:Grayling Construction. Blue Luis Granite with frameless bamboo cabinets brings very elegant looking to this beautiful modern Asian style kitchen. · Fake cracking feeling: Since the granite should be cut for your countertop, if the patterns are on the edge, you might be disappointed with that feeling. To make sure if there is no cracking, use your nails or razor and make smooth motions on the surface. If you feel the roughness, you are right to fight with your installation company for cracking. Otherwise your selection makes you fool. · Loosing the pattern during the cut: Happily chosen granite slab can turn into a nightmare after the wrong cut. Your best part of color and pattern is in the sinkhole! Make sure that your installation company has wise cutting person not to loose the pattern. You might make a very best of selection of color. Your selection will be more valued by lighting, and granite countertop labor. Please stay tuned, my next article will tell you more about the lighting in the kitchen. Lighting: The best natural light is sunlight at daytime to show your granite countertop color. Unfortunately, mostly kitchens cannot catch the sunlight. If your kitchen has fair light or no natural light, the best recommendation would be granite with a significant amount of white or gold, or lots of light-colored specks, or metallic specs. In very well enlighted kitchen , darker color granites are better like deep blue, mahogony, and black. Reflection of the light can be seen in excellent way if the conditions are to be considered. The aim of the collecting the samples and investigate them in your kitchen is also lighting. Picture Credit: Highmark Builders. There is no doubt that Gold Arrow Granite is the best choice with the selection of pendant lighting and backsplash. Adorable work. Labor: Finish and cutting edges makes your granite countertop more visible and more lovable. Please ask for the installation company a finished sample when your decision is almost done, by your taste. Polished: After polishing your color is getting darker but it looks smooth and shiny. This type is the most popular. Aged or rustic: Granite countertop color looks older by brushing. Leather: It a blend of polished and honed finishes. Satin: Very durable and the color is vibrant and it is not very reflective. The Ogee Edge: It looks elegant by including a small divet within the edge. Mostly goes with classic design. Picture Credit:Progressive Countertop Systems. Perfectly elegant double ogee edged Giallo Ornamental. Eased or Straight Edge: It has a rigid, constant appearance, and no embellishments are cut into the granite. Bull Nose Edge: It is rounded from the top rollover all the way back to the cabinet on the top and bottom of the granite edge in a sideways “U” shape. Picture Credit: Granite Grannies . Dramatic looking rainforest brown granite with half bull nose edge. I am hoping to be very helpful by having these tips to who is the first time in granite color selection for countertops in your kitchen remodeling pool. Please do not hesitate to build more helpful page by adding your comments.